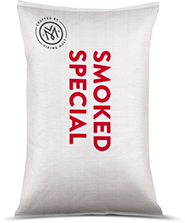 Smoked Wheat Malt is produced by using the oak from the unique, natural areas located in the north-east of Poland. These are called “Polish Green Lungs”. Smoke from oak gives the malt specific and delicate aroma. Due to relatively low processing temperatures, enzymatic activities and other good brewing properties are maintained. In the brewing Smoked Malts can be considered as pilsner malt with a special aroma as Smoked Malt’s flavor and taste profile is not too overwhelming. Smoked Malts can also be used in bakeries as a spice. Smoke from oak wood gives the malt specific and delicate aroma. We’ll help you make beers that people tell stories about. Find inspiration in our recipes and brew reports.